Oh, the things you do when you're stuck in an elevator alone, after calling for help of course. There's nothing to do but wait while the response team comes - you start to wonder if there will be a cute firefighter amongst them who might just strike up a conversation that would lead to a date (or maybe just some drinks first) and then you'd fall hopelessly, helplessly in love and get married. After a while, that daydream fades away as the firefighters (or rescuers) take too long to arrive and you figure that maybe they're all old and haggard and tired anyway. There probably wouldn't be a handsome young guy in their midst, and even if there were, he would most likely turn out to be a jock or something. The brainy, sensitive guys wouldn't take jobs like those and you were sure you'd rather have an intellectual for a husband than a muscle man. As you slump into the corner of the elevator, fanning yourself with a stray piece of paper from your handbag (last Sunday's church bulletin, you notice distractedly) you recall the last time you talked to that nice fellow in church - the one you've been secretly having a crush on for the past year. In your mind you're with him on the phone, telling him about your day and how you're stuck in the elevator and somehow you find yourself talking aloud. Figuring that there's nobody around to hear you, you continue on the conversation, and find yourself telling him how much you like him and how you hoped that he'd notice you someday though you were fairly sure for all intents and purposes that he was actually eyeing someone else. Why else would she know everything about him? You let slip his name a couple of times, instead of the code words you use, even in your head, because you like the way it sounds on your tongue. And then suddenly, you hear sounds on the outside of the elevator. You call out to them hoping that it's someone working to get you out but you hear a familiar snigger instead. Your face starts to flush as you realise you've been pouring your heart with the speaker button in the elevator toggled on and everyone in your apartment building has congregated on the other side of the elevator door to hear you. Haha. Nice post, Anna. I'm a big fan of the fiction of embarrassment - mainly because I can relate to it personally, having humiliated myself on more than one occasion. Nicely written. Hope you are enjoying the challenge as much as I am. Good luck. I'm having a lot of fun. Good luck to you too! LOL! ..I chickened out ..arghhh!!! Awesome post. And elevators...terrifying. Hate being trapped. 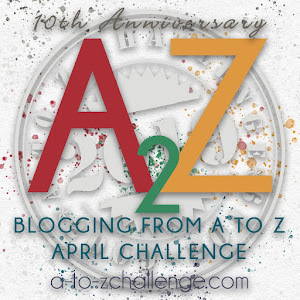 Happy A through Z blogging! I know that my headache may be causing my incomprehension, but please tell me you weren't stuck in an elevator - -else I will start sweating profusely. I wasn't stuck in an elevator, but there have been a few cases in my office building recently.